The concept is to provide women with the latest Technical Fashion items from designer brands so they can look stylish and feel great in practical pieces whilst shredding the surf, snow or trails. Catching up with Nina in Cape Hatteras, NC during the Triple S invitational, not only did I get to take a sneak peak at her divine wardrobe, but we discussed at length her objectives and why she felt the need to do a project such as Blu Girls. It seemed that Nina was frustrated by what was available from the commercial brands across action sports. It’s no secret that men dominate the extreme sports industry, and that often applies to those designing the gear. The term 'shrink it and pink it’ is a common term when referring to products for women, obviously designed by men. The crux of the problem, it seems, is that there are smaller brands out there, normally designed by women, for women often spurred on by their frustration to obtain chic and practical pieces. But as it happens, so often these brands struggle to gain traction in the mainstream market, which is a shame as their products are beautifully designed and often better quality. The other issue lies in the fact that no grown, stylish woman wants to look like a teenager or the flip side of that, which is frumpy and boyish. 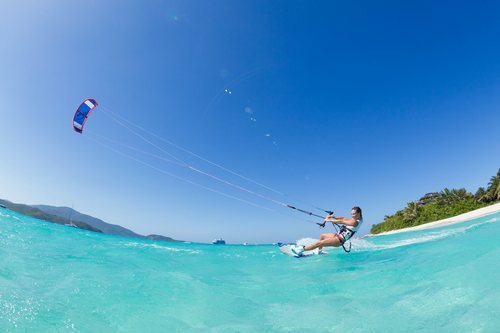 Take kiteboarding for example. Back in the day, women were forced to wear unflattering, down to the knee baggy board shorts. Why? Because that’s what the men were telling us to wear or what was available. Yes there might have been a few just above the knee styles available, but as anyone can tell you, no glossy magazine has ever deemed that as acceptable so why should it have been on the water? Although general surf/snow fashion has come on leaps and bounds since then, it’s the technical apparel side that is still lacking. Bikinis still fall down, wetsuits don’t fit properly and rash guards… practical but horrific. So, what’s the solution? Nina will be combing through the fashion industry hand picking pieces from those smaller brands to place on her ecommerce platform, bringing you the most exclusive, fashionable and functional apparel range via the Blu Girls website. Her research and testing process is intricate so she is sure to find only the creme de la creme of products. Shipping worldwide, you’ll find brands such as Maaji, Seea, Sensi Bikinis and Indah online. When speaking to her, it’s clear to see that Nina is on a mission to give more to those women looking to 'work hard and play hard.’ By creating an online community she aims to join like minded people through fashion and sports. Be sure to follow Blu Girls and stay up to date with the hottest surf, snow and dirt technical fashion out there.